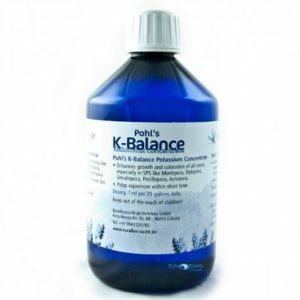 K-balance is the potassium supply developed by Korallen Zucht for zeovit method. It is available in various seizes, depending on tank dimensions and, considering the required dosage, the consumption is quite huge, also on small tanks. Polyp expansion within short time. 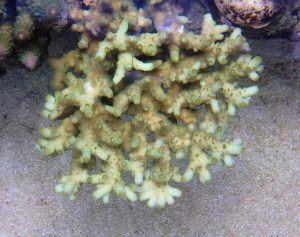 Enhances growth and coloration of all corals, especially in SPS like Montipora, Stylopora, Seriatopora, Pocillopora, Acropora. Potassium integration is highly recommended in all managements that aim to bright colors, however it is useful also in easier methods, as berlin method. It is necessary to pay attention to dosages, each tank is unique, so we should start with a low dose and check coral’s reactions, progressively we can augment the dose till we reach the desired results. Finally I want to mention that potassium is a powerful fertilizer, I discourage its use in presence of algae infestation or in new tanks, where algal cycle is not finished yet. For further informations about boron you can read the dedicated article.